Organizations that embrace cultures of openness are more agile, accountable, and innovative. But how exactly can we build them? In The Open Organization Workbook, more than 25 managers, leaders, consultants, and other practitioners answer that question with their favorite tips for building organizations that are more transparent, inclusive, adaptable, collaborative, and communal. They not only explain—in rich and useful detail—the processes and practices they recommend for architecting the organizations of the future, but also invite readers to follow along, participate, and experiment through a series of probing discussion questions and participatory activities. 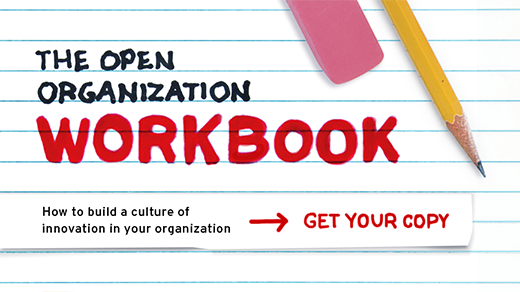 This workbook-style companion to The Open Organization (Harvard Business Review Press, 2015) features case studies of more than a dozen organizations—from start-ups to multinationals—working to leverage the power of openness. It also contains step-by-step instructions for building innovative teams. Download your Creative Commons-licensed copy today by entering your email below. Then check out the other volumes in the Open Organization book series.